This summer has been hot. Once the sun goes down the temperatures are more bearable. 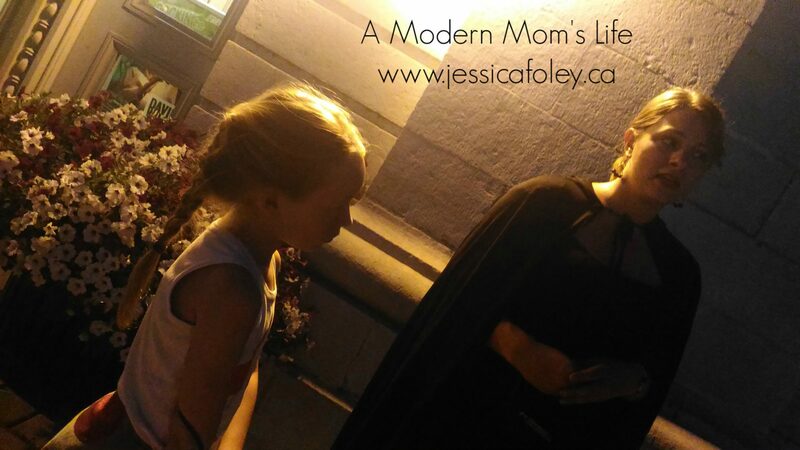 What better way to spend a darkening evening than wandering through historic downtown Kingston, Ontario, listening to local ghost stories? 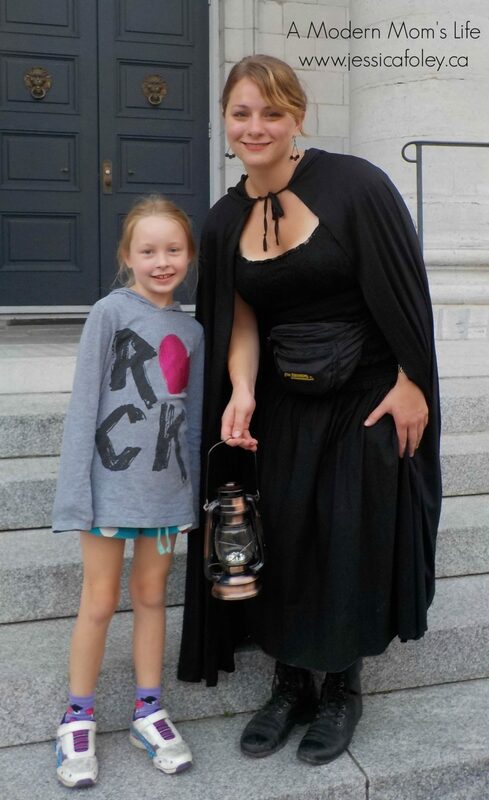 The Haunted Walk of Kingston is a tour company that shares ghost stories of historic Kingston on a 90 minute walking tour. The company’s founder, Glen Shackleton, decided to create these tours after he went to England for part of his studies and attended similar tours there. The Kingston tours were so popular they have expanded this business to Ottawa and Toronto, as well as add a tour at Fort Henry. On the evening of our tour it started to rain around 7pm. Emma was so upset and worried that we wouldn’t be able to go. Luckily the tours run rain or shine. I’m sure they make exceptions for gale force winds or torrential downpours, but a little rain won’t have them cancelling any tours. And thank goodness. The rain ended right at tour time and we gathered with a huge group of people waiting to get going. I was pleasantly surprised that the woman at the ticket desk knew who I was right away. Turns out she was my email correspondent who provided us with this opportunity. Guess she must have actually looked at my blog! (I forget my picture is right there in the sidebar.) She had our tickets all ready and made sure to show us the way to the washrooms. A 90 minute walk should definitely start with a trip to the bathroom – especially when you take your kids! They had 2 tours starting at 8pm and we got placed with the more “seasoned” guide Adeline – she said it was her third year doing tours. She obviously had some drama background as her story-telling was perfect and her timing was spot on. Emma really liked her and spent most of the tour right up front chatting away with her and 2 other young girls who were touring with us. Even though the tour is 90 minutes in length it really doesn’t seem that way. Only twice during the tour do you really think about how much walking you’re doing. At the beginning we left from Market Square and headed to St. George’s Cathedral for a story. The next walk was a few blocks longer before we got to the next story. After that it was a half block, maybe 2, between each story until closer to the end where there’s another 3 or 4 block walk. Overall you’re so distracted listening to the stories and admiring the old buildings of the Sydenham Ward you don’t realize you’ve been walking for over an hour. When I was in university (about 15 years ago!!) I had a friend who worked for the Haunted Walk. She applied for the job after she and I took one of the tours. It’s interesting to hear the same stories again, but updated with more current happenings from people who have been in the buildings more recently. I also liked how the stories get spookier as the tour moves on. The sun goes down and the hauntings get scarier. The tours are designed really well. The stories could be quite scary but the way they are told also lends some humour to the tales. It keeps everyone interested without actually getting scared. Emma did get eyes wide as saucers at some parts but she was never actually scared. It seems I’ve instilled in her a love of thing supernatural, and a love of walking, so this tour was right up our alley! If you’re going to be in Kingston overnight and don’t have many plans I would highly suggest finding a tour on their schedule and going! Emma is ready to check out the one at Fort Henry and their Time Travel tour. Poke around on their website and you can read up on all the fun tours they have here and in other cities! They even run one at Upper Canada Village. Just a note – if they hadn’t offered me a tour in exchange for a review I would happily have paid for Emma and myself to take this Haunted Walk. I found out when we were there that kids under 10 are free! All the more reason to creep out your kids with a Haunted Walk! Emma and I have also taken the Time Travel Trail Tour. Be sure to pop over and read that review as well! Patrick and I also did the Ghosts of the Fort tour as a date night. Have you taken a Haunted Walk here in Kingston (or elsewhere)? Did you enjoy it? Do you know any other great attractions in Kingston? Share with me in the comments – we are always looking for fun family attractions! PS – If you enjoyed this review I have an entire review section on my blog. If you’d like me to review your business, event or attraction take a look at my Work With Me page or contact me to discuss opportunities. Thanks!